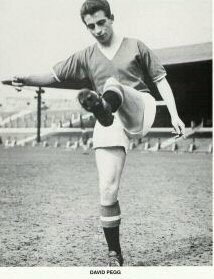 David Pegg was born in Doncaster, a prodigious youngster he was courted by many top clubs until Manchester United snapped him up to replace Tom Finney. He twice won championship medals, played once for England before being one of the tragic victims of the Munich disaster, aged only 23. He was the club's first-choice left-winger, had collected two league championship winner's medals in the two seasons leading up to the Munich air disaster, and made one appearance for the England team just before his death. He was tipped by many to become the successor to Tom Finney in the England team. David was buried in Redhouse Cemetery, Doncaster.